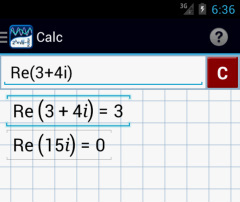 The set of complex numbers refers to the set of real and imaginary numbers. Any complex number can be written in the form a + bi, where a represents the real number part and bi represents the imaginary number part. In algebra, i is used to denote the square root of -1. Hence i^2 is equal to -1. Other keys available on this button: Re, Im, conj, arg. Tap the i key once to use the imaginary number (i) key. Use this key when performing operations on complex numbers. Type the expression as it appears with one on each line. Tap the i key twice to use the Re function. Given a complex number, this function will determine the real number part. In each complex number below, identify the real number. Tap the i key three times to use the Im function. 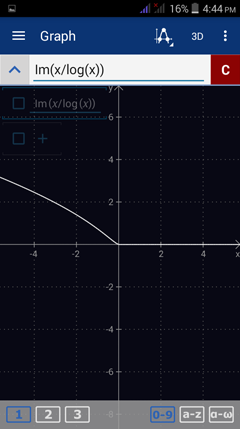 Given a complex number, this function will identify the imaginary number part. 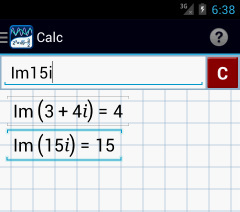 In each complex number below, identify the imaginary number. Tap the i key four times to use the conj function. The conjugate of a complex number in the form a + bi is equal to a – bi. 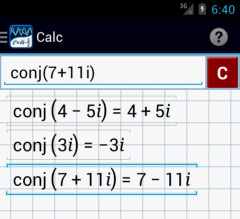 Use the conj function to determine the conjugate of a given complex number. Write the conjugate of each complex number below. Tap the i key five times to use the arg function. The argument of a complex number is the measurement of the angle (in standard position) that describes the direction of the complex number on the complex plane. It can be measured in radians or degrees. Find the argument of each complex number below. 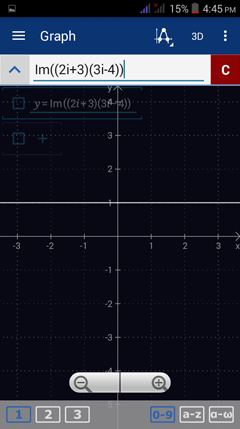 To plot the imaginary part of a function, type "Im" and enclose the expression of the given function. Plot the imaginary part of each function below.